Photo courtesy of Diamond Aircraft. Let me paint you a picture. Until March 2018, I typically flew 1980s single engine Cessna 172 when I could afford it. The hourly rates were the cheapest I could find. The Cessna 172 contained an ageing instrument panel consisting of some hard to read and worn steam gauges, no GPS and no autopilot. All while using paper charts to navigate. Call me old school, but it was what I was familiar with. That’s what flying was when I first learned to fly in the 1990s. I have quickly discovered, Diamonds are forever when it comes to aircraft. Allow me to elaborate. 1980s style Cessna 172 flight deck with the instrument 6 pack and no GPS. This a/c is in good nick. Photo courtesy of Alexander Cunningham. Previously when I had access to a GPS in an aircraft, I always ignored it, as I did not know how to program it. The built in GPS units only worked when the engine was running. I was not going to pay a huge hourly rate to sit in the run up bay and teach myself how to program a GPS, when I could be flying. I always used paper charts to navigate. In December 2018 I was introduced to the world of an Electronic Flight Bag (EFB). This was the largest game changer for me since TCAS. With a new EFB, all of a sudden, all of the old IFR amendments that took hours on end and had to be done in the correct order, were no more! Now it is a matter of downloading the new amendments in minutes and the updates are complete. Amazing! If there was one thing I absolutely disliked about IFR flying in the past, the monthly amendments. Well thankfully that problem has been taken care of. Now you must make sure your EFB is charged enough to last the duration of the flight. Do you know how much lighter my flight bag is now! I am still blown away by it. The Diamond DA40NG flight deck. Image courtesy of Diamond Aircraft. On January 3rd 2019, I was introduced to the Diamond DA40NG. It is a single engine, diesel powered engine, using Jet A1 fuel. The engine contains an Engine Control Unit (ECU) which automatically controls the variable pitch prop and fuel flow. There is only one lever the pilot manipulates, the throttle. The traditional mixture and prop levers are controlled by the engine. It is an amazing step forward in tech away from the traditional mixture, pitch and carburetor heat lever. Having the ECU makes the run up so much easier and quicker, which leads to less time on the ground and more time flying. 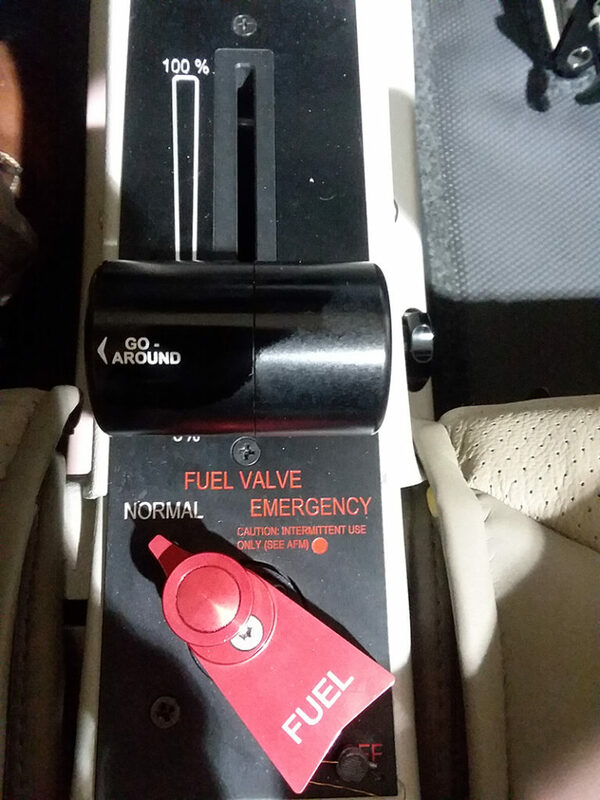 The Throttle lever with built in TOGA button and Fuel Selector valve. The engine settings are in percentage, not RPM and manifold pressure. Although there is an RPM gauge, primarily your looking at the engine setting in percentage. The desired RPM is set by the ECU, based on the engine percentage set. 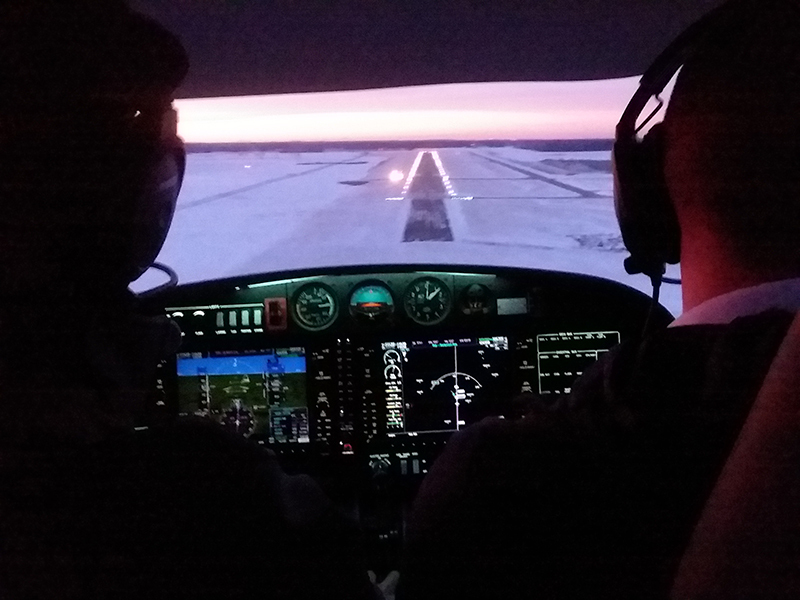 Typical Take-Off percentage is 100% (5 minute limit), climb at 92%, cruise at 75% and descend with approximately 30%. It is so much easier than having to remember two sets of numbers for engine settings with a constant speed prop. The True Airspeed (TAS) at recommended cruise (75% engine setting) is 125 knots, which is great for new flight students learning to navigate cross country. (Hint: It’s a fraction over 2 NM a minute) The fuel burn is approximately 6.6 US Gallons per hour (25 liters per hour), with a usable fuel capacity of up to 39 US Gallons. Leaving the aircraft with an endurance of just under 6 hours flight time. The new engine setting gauge is new to me and I love the simplicity of it. 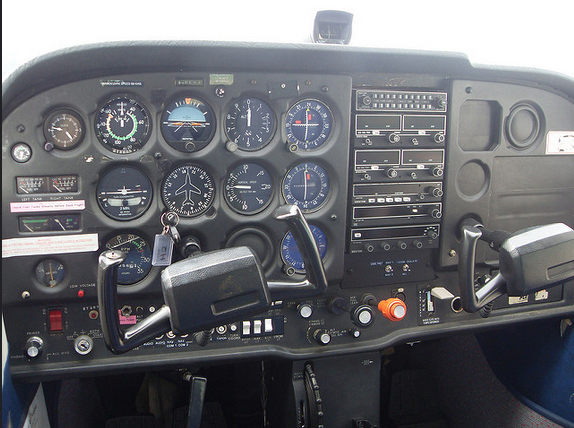 The instrument panel consists of the G1000. I am very new to the G1000 and I realize there are a lot of young pilots with a lot more experience using the G1000, but it is amazing. I am still getting used to the layout of the buttons, dials and the instrument scan for IFR. From what I have experienced so far, the G1000 instrument scan is a lot easier than the traditional 6 pack and navigation aids. So far, I love it! It will still take me a while to look at the Multi-Function Display (MFD) moving map, as I am most certainly not used to that yet. I am manually programming frequencies at this stage, but I am grabbing the frequencies from the EFB. I am happy with having achieved that so far. The one item of the Diamond DA40NG is am still in the process of getting used to is the nose steering or lack of direct nose steering. As you know, direct nose steering is done through the manipulation of the foot pedals in any Cessna, Piper or Beechcraft manufactured aircraft. The Diamond DA40NG does not have any direct nose steering through the foot pedals. 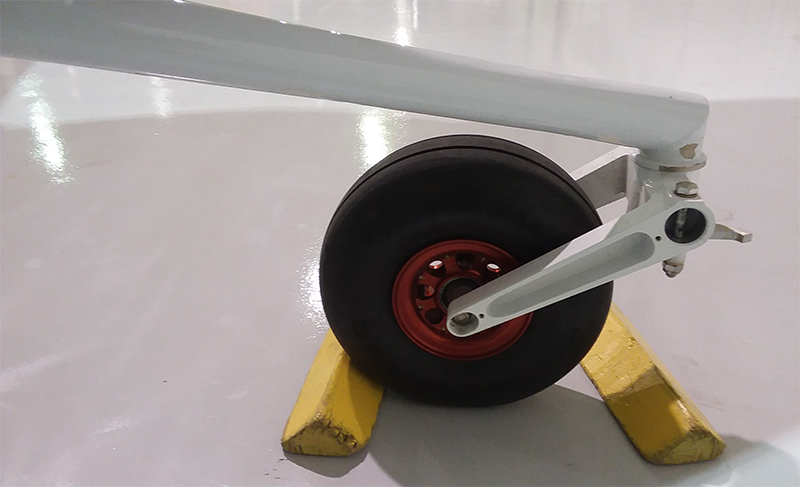 In fact the front nose wheel is quite simple. It reminds me of the front wheel on a shopping cart, although it has a range limit and will not completely spin around. 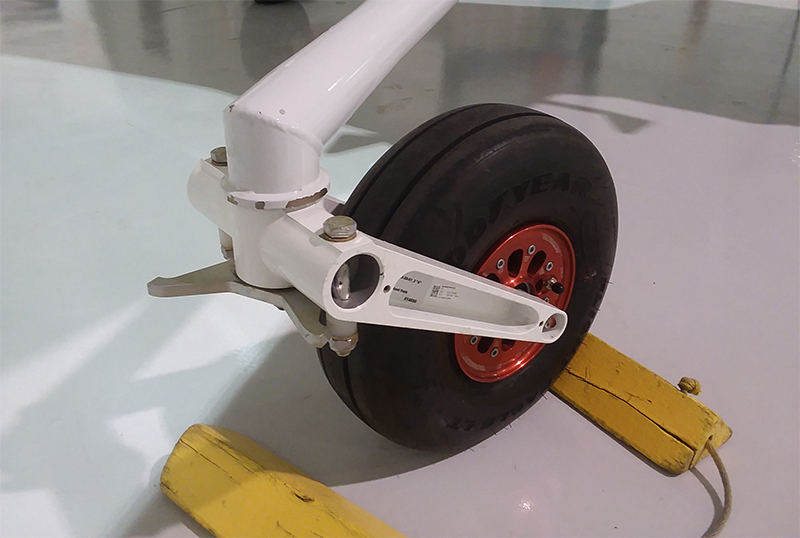 Differential braking is used to guide the aircraft while on the ground. Above 15 knots, the tail section starts to become effective for steering. The take-off roll is straight forward with the lack of direct nose steering. I would recommend rolling forward so the nose wheel is straight before you come to a complete stop. That way, when you start rolling again, the nose wheel is already straight. No direct nose steering connections. The limiter on the front limits the turning ability of the nose wheel. Differential braking is required to steer. The Diamond DA40NG is excellent and very smooth to fly. Every pilot I’ve spoken with about this aircraft love it! This includes Cirrus pilots, who prefer flying the DA40NG. This bird really wants to fly. When it comes to slowing down in the pattern (circuit), when extending the T/O flap, you really need to physically push the nose forward to prevent climbing. On short final landing at Indianapolis Executive airport (KTYQ). As time progresses and I learn more about the aircraft, I’ll write about interesting tidbits of information about the Diamond DA40NG. Based on my limited experience so far, I have to say; Diamonds are forever when it comes to aircraft. Aircraft, Aviation, DA40NG, Diamond, Flying, G1000. Bookmark.